Businesses of Azerbaijan, the leading nation of the South Caucasus with a population of 10 million people, striveto enter China. Being the second largest economy, China, without any doubt, has earned a global leader status on the international stage, and it seems impossible to disregard such world realities today. Azerbaijan, which is a developing country, views China as an attractive market. There is a good level of mutual understanding and strong will of both sides to bring the economic and business ties to a practically new stage. In a recent interview to Chinese CGTN, Azerbaijan's leader Ilham Aliyev stated that the country has already sent several export missions to various regions of China, which is expected to hugely contribute to the development of trade. Particular results of the implemented measures were named. For instance, Azerbaijan has already opened its Trade House, where local products are demonstrated, in China's Liuzhou. In addition to the opening of the Trade House, the sale of wine and pomegranate juice produced under the 'Made in Azerbaijan brand has begun in the western part of China. The first Azerbaijan's Wine House abroad opened in China, Urumqi, in September 2018. The country's second Wine House in China opened in Shanghai on November 8, 2018. Azerbaijan also participates in large exhibitions organized in China with its agricultural products. President Aliyev voiced a very important call from his country. Azerbaijan wants to show the Chinese businessmen its achievements and intends to gain access to a very large, significant, attractive market for its products. 'At the same time, our doors are open for Chinese businessmen. As I said, we would like to see them more as investors, the trading side, contractors, he said. Of course, Chinese ambitious Belt and Road initiative was not left behind during the interview. Azerbaijan is a supporter of this initiative and intends to do everything possible to become a very active participant in this project. Speaking of this active participation, President Aliyev noted that Azerbaijan works with its partners in Central Asia, Georgia, Turkey and Europe. 'Naturally, our main goal is to accept goods from China and ensure their transportation. Inside Azerbaijan, everything is ready. At present, Azerbaijan possesses the largest fleet in the Caspian Sea. These are mainly tankers and other cargo ships. They transport goods from the East to the West and back. Of course, we would like more Chinese companies to work in Azerbaijan, so that they invest in our country, find new opportunities. Thus, 'One Belt, One Road is indeed a very important project for us. We fully support it and have contributed to the creation of his missing part, he said. In this regard, the importance of the railway which starts in Baku and goes to Turkey, that is Baku-Tbilisi-Kars, was underlined. Before that, goods that came from Asia were transported through Azerbaijan to the Black Sea ports of Georgia. Now, the cargoes can travel straight to the Mediterranean coast, and also by rail - directly to Europe, in turn providing Azerbaijan with revenues, making the route cost-effective and less time-consuming. Azerbaijan has made significant investments in its infrastructure projects over the past period. Everyone understands that such investments are of long-term nature, which means that the benefits may come in ten, twenty or even fifty years. Naturally, people prefer not to focus on long-term results, but rather look for short-term outcomes. 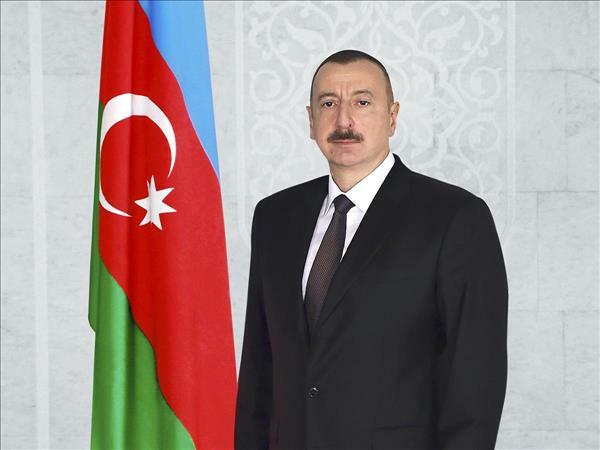 Commenting on this issue, President Aliyev emphasized that Azerbaijan's goal is to create good conditions for the people. Therefore, the country upgraded infrastructure and created conditions for the benefit of business circles. 'These investments are for the future. We do not expect that the investment will pay off, perhaps in the next ten years, said the President. Azerbaijan has entered the stage of rapid development after the discovery of major oil and gas field and signing of the Contract of the Century with global energy companies. Currently, the country aims to create new sources of income other than oil and gas sector. It is obvious that one day, the energy resources will run out, but the geographical location and the modern infrastructure will remain in place, thus bringing the state necessary incomes. Moreover, infrastructure projects in transport area also create new geopolitical situation in the region. The countries involved in a joint transport project usually enjoy closer relations, since they share the benefits. This happens in multilateral formats as well. The Baku-Tbilisi-Kars railway has brought the peoples of Azerbaijan, Georgia and Turkey even closer. Such projects can be considered as a political tool for increasing dialogue and reducing tensions. Azerbaijan has always vowed for active cooperation and mutual support of the regional countries with a common aim to achieve political and economic stability. In recent years, the work to increase the transit potential of the country, create a modern infrastructure that provides international transportation, and upgrade the transport fleet has become more intensive. The implementation of such important projects as the construction of the Baku International Sea Trade Port, not only increases the economic power of Azerbaijan, but also strengthens its international position. 'We are creating a mechanism for attracting investments, at the same time providing loans to the private sector at very low interest rates, so that they can also invest in industries that generate income in a short time. For example, industries such as agriculture, small and medium businesses, he said. 'Spend less, earn more perhaps, this is how Azerbaijan managed to create its impressive infrastructure without getting into debt. The country's foreign debt makes only 19 percent of the GDP. Reasonable use of revenues from the oil and gas sector and favorable geographic location allowed a small country to turn into a transport hub with the most up-to-date infrastructure. All transport projects in Azerbaijan have been implemented without borrowing. Some 20 years ago the South Caucasian country borrowed, and borrowed a lot, while today, Azerbaijan is the one who lends money to other states and participates in major projects in energy and transport sphere.